EDIT: March 5, 2011 at 1:48 P.M.
Last week, My Chemical Romance was announced as the headliner of MTV Winter Music Event in Spain on March 12 (to be broadcast April 15 on MTV's World Stage). Today, MTV Spain talked to My Chemical Romance about the Event, for which they all unanimously said they are "excited" and agreed that they love the art, architecture and people of Spain. MTV allowed fans to submit their own questions for the band to answer via Twitcam. My Chemical Romance, who described themselves in one word, "friends," leaned in and squinted as fan questions scrolled by at surprising speed and picked up several to answer. Many fans were curious about future live setlists and what the band may or may not include on them or how current songs could evolve. Much to the surprise of fans, the guys admitted that they would like to play "Early Sunsets Over Moroeville" in the future "if we give it some structure at the end," Gerard said, "That's the problem with that song: It has no definitive ending. It just kind of keeps going." Another I Brought You My Bullets, You Brought Me Your Love song that the band mentioned being interested in bringing back is "Skylines in Turnstiles," the first song written by MCR, which Frank said would fit well with the band's 10 years of playing together. MCR also discussed, though did not say they would resurrect, the long, lost track "Sister To Sleep" of which many fans have a live bootleg, but nothing more. The band said that it was recorded with what they called the "Manhattan Demos," however, no one in the band actually has a version of the song. Of current songs the band plays that they would potentially re-work like the new, Live version of "The Ghost of You," Frank Iero said, "Each song has a place in the time when it was written, but it's kind of fun to play live old songs and reinvent them." Gerard added, "I've wanted to re-record songs like '[The] Ghost [of You]' or 'Vampires [will Never Hurt You]' just to see what happens these days." 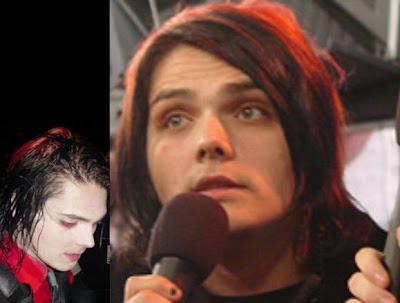 When asked what inspires the creation of those songs, Gerard Way said, "Life filtered through the lens of our childhood and movies that we really like. Cinema, books and life." The band also discussed other projects like The True Lives of the Fabulous Killjoys comic, which Gerard said will be released "hopefully this year." 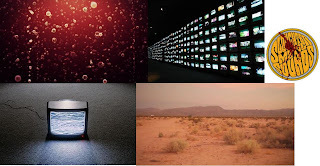 And the possibility of a new video documentary of the band. MCR admits that they have been talking about the possibility of a new band video diary. "We would love to do a bit of a follow-up to Life on the Murder Scene. Kind of like the first ten years of the band and where we are now. We've been talking about it a lot; we don't have any cameras out with us, really, though," said Gerard. 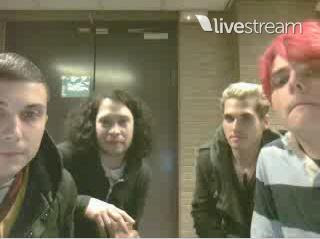 Why does Mikey not smile or "Mikey Way, why you no smile?" Gerard: "How 'bout THAT! How 'bout THAT!" "Gerard, you're too sassy for me..."
Frank: "For me, too. Gerard, you're too sassy." "Mikey, what is so awesome about unicorns? Gerard: "We'll try to rectify it here, but it doesn't seem to do anything. He doesn't like them. It's a myth." Mikey: "It's an outlandish rumor."